As a London taxi driver I recently dropped a young lady off at Thornhill Crescent and she suggested I visit this website. It was a nostalgic fare for me as I was christened in St. Andrew’s Church. I also attended Sunday School there; I think the vicar’s name was Mr. Curley. I lived in the area – Shirley Street (now gone), just off Matilda Street – and attended St Thomas’ School in Everilda Street (now also gone). I was born in 1948 so my ‘active’ time around the square would have been from the mid-fifties until the early sixties. The square was always a favourite place with the local children as it was the nearest open area of grass – plus trees and a playground. What struck me most when I drove around the square was that nothing really had changed! The swing park is how I remember it; the big Plane Tree by the swing park is just as majestic, and I remember a pair of Crows always nested high up in its branches. The best bit, for us kids, was the small hill just to the north of the Plane Tree because it had plenty of bushes to hide in and to have a crafty cigarette (I was about fourteen by then – 50 years ago). Also, at the southern end in Matilda Street was the Buffalo Club. Not a disco, but a working men’s club where adults went for a drink and a jolly-up. Those of you around at that time may also remember we had a milkman in Matilda Street. He had a small dairy and a cobbled yard where he kept his horse! His name was Bill Morgan. You may also recall a lady known as Beetroot Annie who sold her beetroots on the corner of Tilloch Street and Caledonian Road. And, of course, the Home & Colonial store in Caledonian Road. Probably my earliest memory was at the age of four or five attending a party in Matilda Street to celebrate the queen’s coronation. Just across the ‘Cally’ was Tilloch Street where my cousins lived and I remember vividly the gaps in the rows of terraced houses where a bomb had landed during the war. These ruins were our playgrounds. In fact my cousin, who is ten years older than me, says he remembers barrage balloons above the area during the war years. Thornhill is a beautiful London square well worth preserving. I just hope it stays that way. 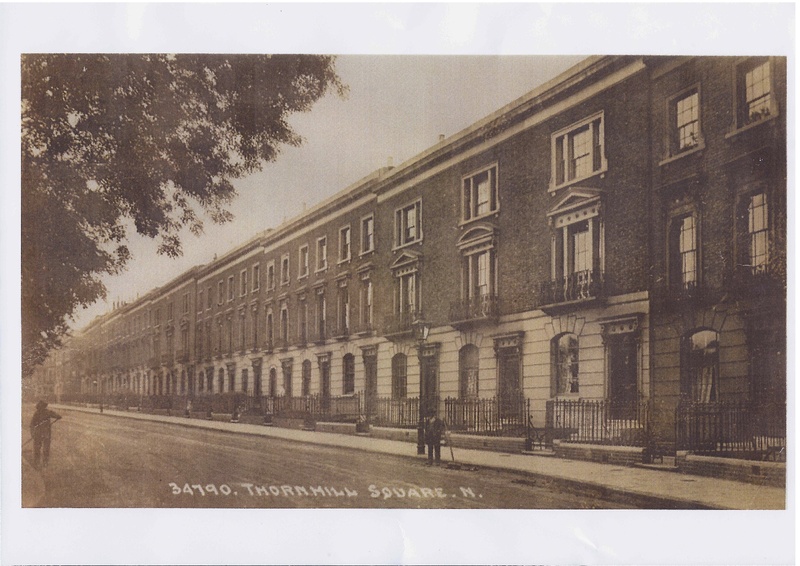 I came across your website about Thornhill Square and saw a little mention about the Huntingdon Street bombs in 1940. My great great grandmother, great grand aunt & either my great great or great great great great grandfather (we're still working on that part of the family tree) as well as various other members of my family/family friends also died. I'm working on the whole list – but I have heard stories of the bombing from my granddad who heard them from my great grandmother. I can definitely say one of the houses was 55 Huntingdon Street and that my great great Grandmother Annie Hislop did survive only to die later that day (the story goes that the ambulance people nearly dropped her and she died of shock – not too sure if that's true but that's how the family story goes). And unfortunately for my Hislop family members – they had been moved from Lyon Street (in the only house left standing!) to Huntingdon Street – persuaded by my great grand Aunt Emily McEllhatton (nee Hislop)! 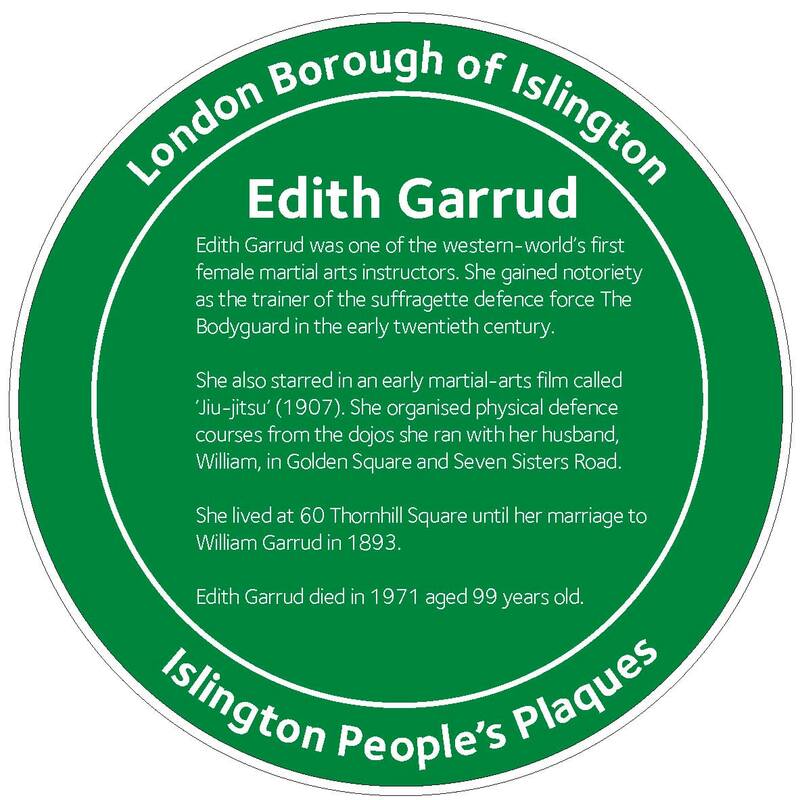 The family left stayed in Islington (and merged with the Busbys on the marriage of my great grandmother) and the Barnsbury area in general until fairly recently. I could probably ask a bit more about the Huntingdon street bomb when I next see my granddad and uncle (who has the death certificates of some of those who perished). 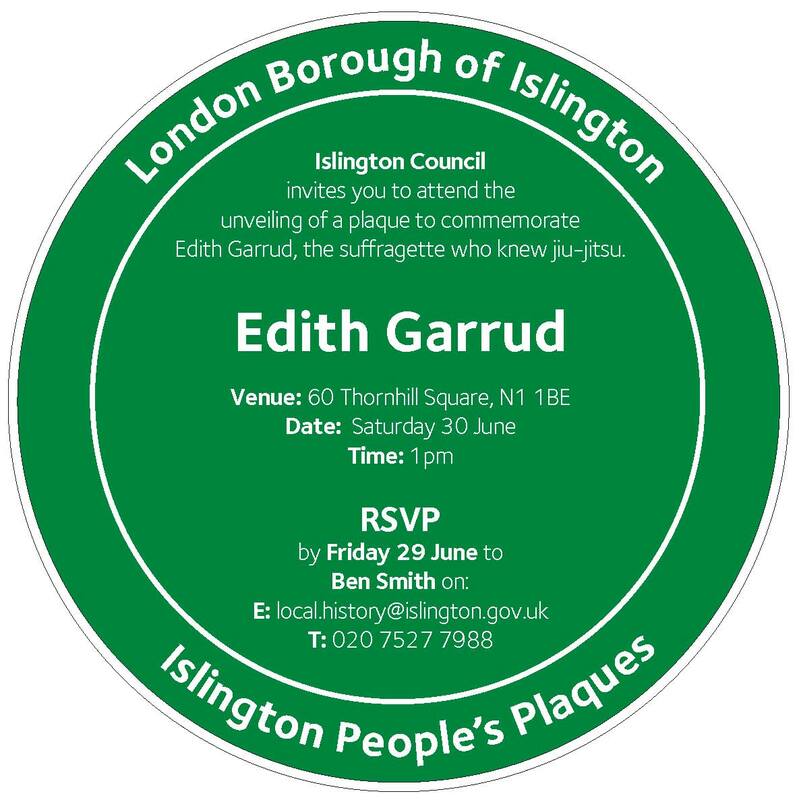 I know residents of 55 & 56 were on the Islington Civilian Roll of Honour, and I think someone in 57 was on the list too but I don't remember seeing it when I was searching it. And I know for definite that 7 members of the Graham family, Nellie and Frank Howell, Annie M R Davies plus my great great grandparents Annie & Cornelius Hislop & great grandaunts Violet Hislop & Emily McEllhatton were the members of 55 who didn't survive – so if anyone recognises the story or names – they can check the commonwealth war graves commission. I don't mind if you put these up now, I have the general gist of the story and if I get anything extra from my grandfather or uncle when I go down to see them tomorrow, I will most definitely email you back with any extra details! I have just read your web site with great interest. My late mother Kathleen lived at both 19 and then 29 Thornhill Square until her marriage and subsequent move to Scotland in 1947. She was then Kathleen Giltrow and along with her mother May lived at number 29 in a ground floor flat throughout the 30s and 40s. My Grandmother lived on in the Square until about 1970. I really enjoyed the account of life in the Square written by Charles Humphreys as many things he wrote about were similar to stories told to my sister and myself by our mother when recounting her childhood memories. I wonder if they knew each other? We often spent summer holidays in London alas not in Islington but at our Great Aunt's much larger house in Ealing. 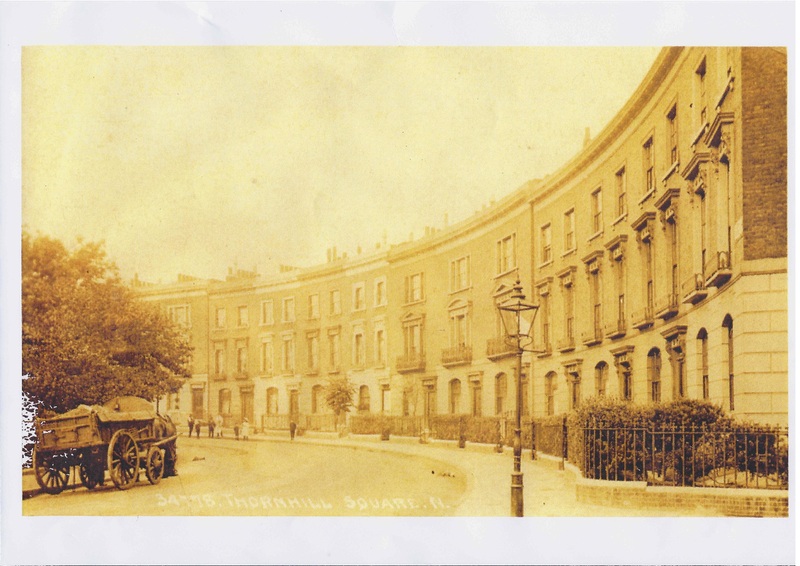 Although my mother lived in Scotland from 1947 until her death at the age of 85 in 2009 her 'home' was always London and in particular Thornhill Square. She loved her life there and although she lived through all the hardships of WW2 she recalled with fondness the community spirit of the householders supporting each other during the Blitz, dancing to the Big Bands at Covent Garden where she met my father (who was at Sandhurst in 1945), and her beloved job at John Lewis in Oxford Street. My sister and I visited the Square in 2008 and took many photographs to show our mother who unfortunately wasn't fit enough to accompany us. What a pity we hadn't come across the web site when she was still alive! 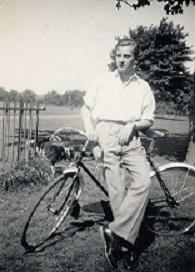 I have just come across your web site which was very interesting as I lived at 9 Thornhill Crescent 1940 – 1953. The Barnsbury Wood must be delightful and such an oasis of calm. I knew it was there because a friend lived at No.29 and we used to get in over his garden wall! I read the article by Charles Humphries and it was just as he describes even 10 years or so later. The Caledonian Road was extremely lively in those days with good individual shops each side of the road and stalls lining the west side every day and all very busy. The stalls were still there after dark all lit with oil lamps and there seemed to be a Public House on every street corner! The war years saw the removal of the house railings and a large brick air raid shelter erected in the road of the east section of the Crescent. There was an air raid wardens post built into the the Church grounds on the south west corner.The RAF had a barrage balloon station in the Square. St Andrew’s church was where I was baptised in 1930 and was important to me as I grew up. I’m sure it is rather different now. I last visited the area about 25 years ago and the Caledonian Road was pretty desolate, maybe I should come again but it is a long way from Sidmouth where I have lived for the past ten years. I hope that you will find the above to be of interest. Thank you for your kind reply to my email, it is rather nice to have contact with somewhere that was such a large part of my early life. You asked who else lived in the Crescent and the following recollections come to mind which I hope will not be too boring! I of course lived at No.9 with my parents and other tenants whilst nextdoor at No.10 was my father’s aunt Mrs Kendall, a widow who let out rooms which for one week each year were let to bandsmen from the north who came to take part in the National Brassband Championship at the Royal Albert Hall. The house on the corner of the Crescent (eastern section) with the long path was occupied by a rather reclusive Dr Traquire, he didn’t practise locally but was possibly a consultant/surgeon at a hospital. Before coming to the Crescent we lived in Huntingdon Street and our doctor was Dr Eustace Jackson with a house and surgery on the corner of Huntingdon Street and Crescent Street. There was of course no NHS then and one paid his fees (I believe he delivered me). He possessed the only motorcar in the area which was garaged next to the surgery and was chauffeur driven (peak cap and gloves)! The doctor’s name was in a stained glass panel on his surgery window. 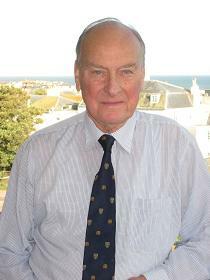 My friend at No.29 Thornhill Crescent was Gerald Burdock who lived with his sister Audrey and his parents. At No.31 was Mrs Sargent who ran a boarding house for warders from Pentonville Prison. 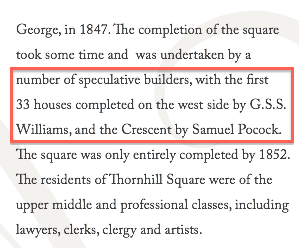 The only people I knew in the Square were a batchelor, Charles L Pace, a retired architect who had a rather elegant top floor flat about the middle of the western section, and the Thorpes who lived about five or six houses down from the library. Oh yes, the Williams lived in a house nearby. What a screed but you did ask for it! I have extracted the following from some of my autobiographical writing and you are welcome to use this and my previous email on the website. The following may be of interest although I realise that it is similar to Charles’ description. I seem to have gone on rather but hope it is of interest. Glad to hear the Cally is still lively. I am sorry that I forgot to answer your question regarding bombs in Huntingdon Street. Yes, a bomb fell on the corner of the street opposite Dr Jackson (north east corner) demolishing two houses. The only other house to be hit was at No.18 next to where I was living. This was not a large bomb and was, I think,a fire bomb, the house survived. The immediate area was very fortunate in not having much damage but a whole area of Copenhagen (east) and the streets around was devastated when a V2 rocket fell. It left a vast waste area which I believe is now filled with flats.